I was driving to work the other morning and started to think about where I am in this weight-loss journey and I was filled with mixed emotions. I have mixed emotions about where I am, where I’ve been, what I’m doing and everything. For me, the best way to work things out is by putting you down in black-and-white. So here goes. I am still immensely proud of myself for what I have accomplished in the weight-loss arena. How many people can say that they were once over 300 pounds and lost down to where they were considered healthy and the perfect weight (according to my doctor I was right in line) I am proud of that fact. But, on the flipside I am embarrassed to be the weight that I am right now. I know that the weight regain is all my fault. I can attribute stress of a divorce, changes in life, and a whole variety of other life situations as reasons why I regained…excuses. But I am the cause! What conflicting emotion! Pride wars with self shame! I want to lose this weight fast! Who wouldn’t. I did the restriction thing before, and it does work. (Obviously since I lost well over 100 pounds). I’m not restricting my diet this time, well I’m not instituting major restrictions. Consequentially, the weight loss is much slower this time around. I am not having the 2 to 3 pound loss each week like I had the first go round with this weight loss journey. However, I am also still eating pizza, ice cream, cakes and candy. It’s just in moderation! It’s slower.....much slower! But that is where my mixed emotions come into play. I have a friend on weight watchers who lost about 10 pounds in August! (Go Julie). I have lost 12 pounds...in JULY and August! I vacillate between the desire to knuckle down and strictly re-strict and lose this weight fast (relatively) and the desire to stay the slow and steady course. I have chosen this course simply because the fast (faster) way worked short term, but it didn’t teach me how to live and still have a balance with the foods I love. (Cakes, candy, pizza, etc). Now if I have learned anything from writing a weight loss blog over the past 13 years, I have learned that best laid plans are subject to change! I have written extensively about a belief or idea only to a year later do an about face and go down a different path. Life changes, our bodies change as we age, our circumstances change and with those changes come alterations in our plans and beliefs. I’m ok with that. What is working today may not work tomorrow. Right now, even though I am vacillating in my emotions on my path, I am continuing forward with the belief that my path is teaching me long term eating habits that will set me up for a lifetime of healthy eating along with a healthy weight. So the warring emotions? Let them battle...I’m still pushing forward on my chosen path! Health is the end result, that’s what matters!!! * I made cheesecake on Sunday...I ate NONE! * I have discovered a delicious edible cookie dough recipe. (I sometimes wonder if it’s even worth my time as I’ve been eating raw cookie dough with eggs and unbaked flour since I was a wee lassie). It’s hard for me to resist when we have it in the fridge! We finished up one batch and I was asked to make a second batch! Yeah I didn’t say no, I made it...I ate it! * I have in the past dealt with a sore aching hip..the pain radiated down the back of my thigh. That has reared it’s ugly head!!!! I have been holding steady at my current weight. Not losing...not gaining. I want to lose but I’m ok with the maintain. After the crazy month of fluctuation this is a welcome relief! Maybe my body is finally adjusting to whatever was causing the weight craziness!!! We have no major plans as of yet. We have talked about going away. Plus there are a few line items that have to be done (laundry, groceries, house cleaning) and a few line items on the list that are a want (shampoo the carpet, wash the quilt on the bed). We have talked about wanting to do something fun and unless life gets in the way that’s a definite!!! Time will tell!!! I have been struggling with something. It is not really weight related per se. It is however totally related to me and my emotions. We are talking about fear specifically about going public on a short book I wrote. Fear is crazy...I have feared losing weight..and it HAS sabotaged my weight loss efforts. I know when I fear a trail on the mountain bike I struggle and ride horrible. When I’m fearful I don’t have as much success. When I’m fearless....life opens up. So how does this pertain to now??? 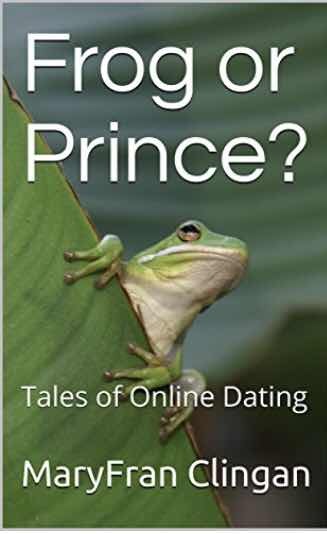 A few years back I had written out my online dating experience as it happened, ending up with a cohesive chronicle/book. I’ve always had this thought in the back of my mind of doing something with it, but I never really knew what to do. And in the honesty,I never have the time to really pursue anything too heavily. A few months back I decided to self publish this book on Amazon. I spent a little bit of time here and there on my weekends and I had some other people spend a little bit of time reading it. Eventually, it was ready to roll. But then, I was overcome with fear and I didn’t do anything!!! I have written some things before and published under a pseudonym and it wasn’t a big deal… No one knew it was me…no fear!!! But this time it was totally different, I would be publishing a nonfiction piece under my own name. Everyone that read this would know this was my work. Talk about fear? Huge! A week or so ago I was talking to my friend Sue and mentioned that I was about to pull the trigger and go live, but I was so fearful. She gently encouraged me but I still didn’t come clean with the world! But then last week I saw and heard a few quotes about fear and I knew that I couldn’t let my fears rule me any longer. Frog or Prince by MaryFran Clingan. Noooooo. I don’t want the weekend to end!!! I am dragging on this Monday morning!!!! We had a really low key weekend, which is what we probably needed. Our low key weekend gave me some insight to the weigh in pattern that I have been seeing, so that was good! But in the grand scheme of things, my eating was horrible!!! So without further ado, let’s get into the nitty gritty of my weekend! We actually hopped on our bikes on Friday evening and did a small jaunt on our local path. We had skipped Thursday and felt like we should go on Friday to make up for the skipped day. I can slowly feel my legs getting stronger! We didn’t sit on the bike the rest of the weekend! No big ride like normal! On Saturday we just felt like slugs and had no energy to do anything more strenuous than to walk through a store or two! What happened on Sunday? We had family obligations. As I mentioned. We were total slugs! On Saturday we did our errands and went into a few stores. It was early on that we knew a bike ride was not in the cards for us. So we instead hit up the antique store near us and then went on a search for a retro game system! We ended up buying the Sega retro system It’s so neat to play the old games! I see another purchase or two in the future, the Nintendo version and the Atari version! Sunday we hit up another antique store, visited my mom and spent some time at Jason’s parents house to celebrate his belated birthday. Of course we had to try on the fun hat at the antique store! Well, let’s just say that my food was delicious this weekend! It included fried macaroni and cheese, pizza, French fries (baked), edible cookie dough, chic-fil-a milkshakes and of course birthday cake. I had veggies and healthy things also! I actually smashed the pattern of my weigh-in’s this weekend!!! Yes I did! It wasn’t all good. I never dropped to my Typical Saturday low weigh in weight. My weight stayed steady through out the weekend. Im actually happier with that than with seeing the really low weight on Saturday just to see it pop back up by Monday! * We didn’t ride this weekend! I have been wondering if the intense hard ride on the weekend is affecting my weight! Who knows...but I’m going to try to keep the diet soda away! And the biking...well that’s returning!!! Sometimes, you just have to listen to your body and be a slug! Sometimes our bodies need the rest!!! Next weekend is a three day weekend. I’m already counting down!!!! I am so ready for the weekend! My weekdays are long (my work day is typically 11 hours if I include the commute in the time). So by this time of the week I’m more than ready for the weekend. But, being a Friday it is the perfect time for a recap of my week! So here goes.....a little bit of everything! We have ridden every evening but one this week. The reason for the missed day? My commute one day was extra long due to hideous traffic so I got home a half hour to 45 minutes later...so it was already well past 6:30 when I got home....that coupled with a headache on Jason’s part just doomed that night! We go as soon as we get home. And while we drag ourselves out the door to go, we always talk about how good we feel for having done it! I’ve noticed the inclines getting a bit better....and I think part of that ‘hard’ feeling is in my head! My eating this week has been spotty. I was so determined to smash the pattern on the scales. When I did everything right over the weekend and my weight STILL spiked up, I got disgusted. We all know what happens when disgust takes over right? No? Well for me, I give up and eat what I want to eat! Now, I didn’t totally give up!!! So that’s a plus! I still tracked. I didn’t blow my calories by a ton....in fact I was still within my ‘large’ range of allowed calories. (The large range is is 1200 to 1600 calories a day....but I prefer to keep it down near 1200). Where I slipped up? I added in more carbs...my favorite!!! Carbs are not a friend of weight loss efforts for me! Hey I tracked, that’s something, right??? So my weight was up three pounds most of the week. I wasn’t too upset about the three pounds...it’s within my 3 pound range that I am ok with ...in terms of weight fluctuation. Not happy with it because I want it to be low...but I’m accepting of it!! The one day though I popped up to 5 pounds higher. It scared me...and it was definitely NOT ok. And that scared me into cutting the carbs and getting things back in line! And happily the weight dropped...it’s still three pounds higher...but at least I’m back into that three pound range!! I’m still happy with my plan and my efforts. I know that in the long run that this is the best route to long term success. I know that I could heavily restrict and give up all forms of cake, pizza, ice cream or whatever and have incredible success. I could eat salads every day. I did it before...it works, I lost a LOT of weight. But it also fails. Just look at me and you can see it failed...I’m overweight...obese really!!! It failed because it didn’t teach me how to manage everyday living....long term. There is nothing wrong with salads every day...if you love them every day!!! I love a good salad...but not every day. Some days I love a good cheesy slice of pizza. For me the restriction just took away things I love. The love of those things never went away. I didn’t eat cake...but I still loved it! So this time, I’m slowly figuring out how to have the things I love (in moderation) yet still lose weight and be healthy!!!! I’ve got this...even during weeks when I feel helpless and lost like this past week!!! I was in the shower this morning and wondering what in the world to write about today. Seriously, what can I say? My weight is up....still. What more could I say? I was down about it...and about my eating from yesterday. I was really tempted to just chuck the idea of writing a post today. And then I saw a pack of small pocket packs of tissues (or whatever they are called...purse packs???). I decided to take a picture and just call it a day. But as I took the picture, strength grew from that deep place inside me and I knew what I needed to write. First of all, let’s talk about my weight. I haven’t smashed the pattern and yesterday I was hungry at work. I had a smashing headache. I caved and went to the cafeteria. I didn’t stick to a simple sandwich, I caved and got chips also. Once I got to that point, I just didn’t care and when dinner came I didn’t care. I tracked and I was still only at about 1600 calories. But there was a fair amount of carbs in my day. (Ha...fair amount...how about a LOT). I honestly didn’t care! I cared this morning when it came time to step on the scale and I showed myself up in terms of poundage. Self disgust and self doubt crept into my mind. My weight has been dropping at a rate of a measley 2/10’s of a pound each week. I probably just ruined that by eating all those carbs and the extra calories yesterday. Why bother anymore! I was feeling like a weak helpless kitten! That is when I was tempted to chuck this week’s Wednesday post. I didn’t want to give it up...it’s a habit and i hated to pass it up. But, what could I say? As I was grabbing my phone from beside my bed I saw the three pack of tissue packets. I decided to share my tissues. A few weeks ago my friend Sherry sent me an email with a picture of some tissues because of what it said. I loved it and when I saw them myself, I purchased them. I dropped them on my nightstand and forgot about them...until today. The first pack of tissues. Find your fearless. Immediately I put that in perspective with my current struggles. I am so fearful...fearful that my slow and steady plan won’t work. Fearful on the mountain bike trails (sometimes..other times I feel free as a bird). And I feel fearful of the scales. Im fearful of sharing my writing with the world. I’m fearful of NOT knowing how I am doing...so I weigh every day. (And I’m glad I do...it has shown me the pattern...if I only weighed on Wednesday’s I would not see the fluctuation and the lows and highs...I would just see it as a consistent high). I’m fearful of never getting this weight off! Find my fearless....easier said than done...but it’s time to really search for fearless! Seize the moment. There is no better time than now to make myself healthy. Right now...every moment is a chance to seize the moment. I may have indulged yesterday...but I have right now to do better. And the third packet, the one that made me buy them? Well then....believe in yourself. Along the way I changed my blog title o beliefinmyself. I need to remember to really believe in myself...in all ways of life! It’s time to stop being a weak helpless kitten and instead roar like a lion!!!! Why oh why do the weekends go so fast????? Or maybe I should be saying, why can’t I be independently wealthy so that every day is like a weekend??? Another weekend is in the books and it’s back to work for me. So this post is a bit of this and a bit of that...riding, weigh in results, cleaning and organizing and whatever else comes to mind. We have designated the den/second bedroom as the bike bedroom. It’s also kinda the junk room. 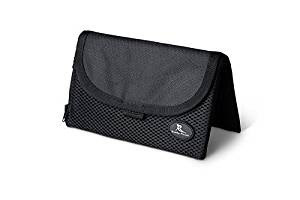 Don’t know where to put something? Drop it into the den! It gets junked up quickly! The dining room is also a quick easy place to dump stuff (shoes, helmets and whatever else!). This weekend I decided to organize and try to find a home for some of those items that end up just sitting around. So I worked on the den. Really I just rearranged one or two things and put some stuff away. I also added a rack for hanging packs and a small shelf. Behind the door on the right is two more bikes. You can see the black shelf on the right by the bikes...that’s what I added. The bike helmets sit on top of that shelf. (They were in the car so they didn’t make the picture). The next shelf down holds my hiking boots, my road bike shoes and the chin guard attachment for Jason’s helmet. The middle shelf holds two bins...one holds knee pads and elbow pads and the other holds random bike parts that we use more frequently than the parts that are in the bin in our storage closet. The bottom shelf holds both pairs of Jason’s hiking boots. It works perfectly and really adds a sense of organization and order to the room!!! The other big change? Was the rack for the bags. We did get out and ride. We rode at Little Bennett Park again...but in a different trail. LOTS of climbing. Lots of tree roots. Some rocks to navigate. A lot more technical than I am used to! I did have to get off to walk around one or two things (mainly because I let my fear get to me) and I did have to walk up some inclines. I was experiencing some weird cramping in my stomach throughout the afternoon (even before we started...so that made the ride a bit uncomfortable.) But, I felt refreshed at the end...and sore! The hydration packs worked wonderfully!!!!! We definitely loaded them up and strapped them on! They say nicely on our backs. The water didn’t slosh around messing up our balance. And it was SOOO nice to be out and know that I had 3 liters of water with me...it allowed me to drink when I wanted and not have to conserve! Weight: did I break the pattern? So, the pattern I wrote about the other day. Where my weight is low on Saturday...and on Sunday pops up, and takes until about Thursday to start to drop again? It was its lowest on Saturday. (By 2/10’s of a pound). On Sunday it was still low. I was cautiously optimistic! And this morning? I have popped up three pounds! In fairness, I did eat more yesterday. I ate 1600 calories....which is NOT three pounds of overeating!!! Oh and I also did mountain biking for 1.5-2 hours...which the apps (MapMyFitness And myfitnesspal) say earned me 2000 calories. So the extra food should not be an issue!!!!! I am so bummed! Grrr! But I’m still within that three pound ‘it’s ok fluctuation range’ so I’m ok...just confused as to why!!! I’m thinking it has to do with the riding. Because typically we ride on Saturday’s and my weight pops on Sunday. This week we didnt ride on Saturday...and my weight didn’t pop on Sunday. But when I rode on Sunday my weight popped on Monday. So that’s my current theory!!! Ahhh another weekend! Delightful! It is actually still ongoing as we both have a vacation day today (Monday!). But what a weekend it has been this far! Of course the normal weekend housecleaning was done and the grocery shopping and errands...they were finished first thing so that we could enjoy the weekend to the fullest! I rediscovered the phrase ‘mind over matter’. We hit up some fun events, we visited one of our favorite places to go as a couple, and we have spent time together. Oh and let’s not forget the celebration of a birthday!!! Years back when I was running a lot, I got in the habit of literally having to ask myself ‘are you dying’, Simply because I wanted to give up when things got hard. I wanted to give up so badly that my head told me I was dying!. It was a constant in my head as I pushed myself harder and further each time I went out. Now, I can’t take credit for the question. Anyone that watched ‘The Biggest Loser’ tv show years back hear Jillian Michaels scream at the contestants ‘are you puking or dying? No...then keep going’ And my brother has told me on many times that it’s a mental battle...our minds are honestly convinced that we are dying! But his advice is that that in reality we are not dying. Our bodies are amazing things...if things do get too precarious, then our bodies will shut down and we will pass out...which is the bodies way of re-regulating us, cooling us down, calming our breathing and heart rate...etc. I don’t know how true that is, since I’m not a doctor. But it makes sense. 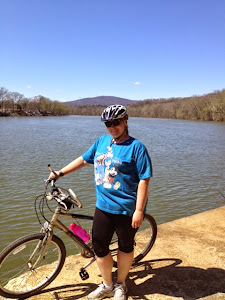 A few months ago we went biking on a trail at the Little Bennet Park. It was difficult on my old bike but I worked it...and walked quite a bit of the uphills. I mentioned it to my brother. In a brotherly way, he reminded me that I wasn’t going to die...that I should have kept riding and not walked! Yesterday, on my new bike we went back to that same trail. I’m not used to my bike, so at times I was quite terrified as I don’t really know how my bike will handle in certain situations. And I almost went down...I somehow saved myself from falling into a pit of mud that I was trying to avoid. (And my bike gave me my first set of bruises as I wrestled with the bike to keep from falling in the aforementioned mud pit.). But I wanted to ride the WHOLE climb up the fire road (which I previously walked). And I was determined to ride the whole trail without putting my feet down. That meant NO breaks and NO walking up the inclines!!! I managed the fire road. The trail...wowzer! I was pushing it! Hard. I was breathing like a freight train! I just wanted it to end...the last bit was bad. 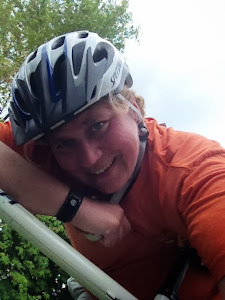 (At one point I even muttered a prayer ‘Dear God when will it end!’ All I could think about was coming to the trail head, getting my bike an inch off the trail and laying down in the grass! I was pushing it HARD! So hard that from behind me Jason said ‘it’s not worth killing yourself’. But by that point I knew I was close to the end and I KNEW I was going to complete it unless my body MADE me stop! I counted my breathing to try to regulate the gasps for air! I pushed! And when I rolled my tires off the dirt trail into the grass at the trailhead I wanted to cry from the exhaustion exhilaration. I sat on the grass for a bit...sipping water and then I was ready to load up the bikes and head home and on to our next activity. Next up in the weekend fun was a bike race! No...not one in which I was participating!!! I was a spectator!!! It is touted as the only race of its kind in America! I went to it a few years back with my parents and brother’s family. Now that We live in Frederick where the event it held and the fact that Jason has never been to the race, it was decided that we should attend. It is a high wheel race. Definitely neat to see. Some riders come decked out in period style clothes. The winner just ripped it up! In this race the riders have 30 minutes to make as many laps as possible. The winner actually passed and lapped the second runner up! He was strong the whole way through!!! He was actually from Sweden, and if I understood the race announcer right, the winner is the owner of the only place that is still. making high wheel bikes...in the world. So here is a picture of the winner. We were not at the finish line...that was around the corner on a different block...but our spot was perfect...shaded...front line and they had speakers set up so we could hear the announcers....but we didn’t need to brave the wall to wall people that was crowding the finish line area. It was fun...and added walking to our list of activities...as we parked way out and walked down to the town center! And Frederick had done a nice job with their downtown area! The birthday boy (ok and myself also) decided to head south into Virginia to stay in Front Royal for a night. We have always just really liked this area. We have spent a lot of time in this area...it’s the closest access to the Shenandoah National Park and the pretty Skyline Drive and miles upon miles of hiking! Here is a picture from a January hike. We took our bikes to Virginia with us. I had grand plans...I found a mountain bike trail last year. (Sherando Park) We actually hiked it. I didn’t remember it as being too rough...so we headed in that direction. Oh yeah...it was a bit over my head in technical skills! Walking it made it seem easy...but it was a bit more than I could handle on a bike!!! I was creeping and had to walk my bike around some steep downhill switchbacks and up some technical rocky inclines. Ohh...and my legs were shot from the day before at the Little Bemnet Park ride. And as if that wasn’t enough. The skies that were blue turned dark and lightening started to pop in the sky. So it was a short ride. Luckily we cut it short as it was a downpour of rain within 15 minutes or so after we got off the bikes. We relaxed the rest of Saturday evening in Front Royal...visiting our favorite stores and eating at our favorite choice for dinner. My weight was looking good at each weigh in. But I am nervous about the scales...I was ravenous on Sunday! To the point of headaches from hunger. I ate way over my normal calorie range. I try to keep it at 1200-1300....I ate 2100 calories. I did burn some biking though...so that’s good! We are still in Front Royal. We will make our way home today. We plan on trying to ride today...if the weather cooperates. It may be on the canal...the deluge of rain from yesterday (and the overnight rain that I believe we got) will have probably made the mountain bike trails too wet. Overall though, I think it will be a relaxing day. I will not forget the mind over matter lesson! I experienced great joy and satisfaction from pushing myself and conquering what I set out to do! My body is responding to my efforts. My legs grow stronger and my endurance builds. I will be back to the mountain bike park that we visited near Front Royal. I will conquer it. It may not be next week...or even next month. I have some skills to learn and some comfort to gain on my bike...and a bit more endurance to build. But mark my words, I’ll be back...with a vengeance!